New print-time estimator in the Info Bar panel. Hourglass model by Taavi Simson via GrabCad. We're shipping more printers every week &ndash; but that doesn't mean we're neglecting our software. Our earliest users have been putting the Form 1 through its paces, and in our latest PreForm update, we're working to keep up with them! PreForm 0.8.3 rolls out a suite of refinements, fixes, and new features to get you printing better. Many of you have requested a PreForm print-time estimator &ndash; and we've added one. 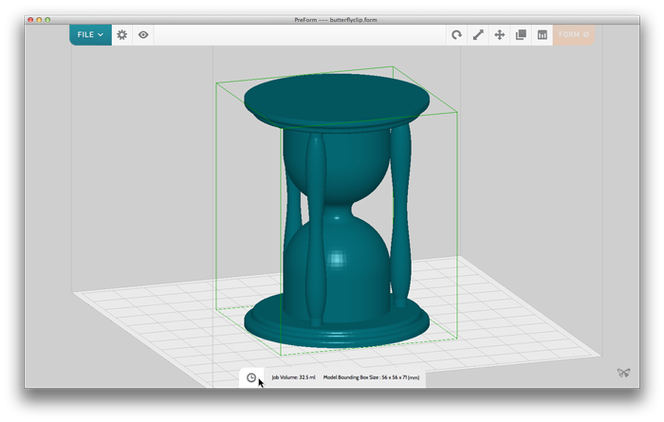 You'll see the new clock icon under the Info Bar setting, which will allow you to get an estimated print-time of your model at different scales and layer-heights. Bundled into PreForm 0.8.3 are also some substantial features that will allow us to solve problems more quickly. PreForm has access to settings stored within the Form 1 itself and it can automatically manage firmware updates. This allows us to deploy new features and fixes directly to your Form 1. With PreForm 0.8.3, you'll receive a new firmware update that allows your Form 1 to send diagnostic and performance information back to your computer. Knowing how effectively your Form 1 is functioning is critical for us in improving its performance, and correspondingly, PreForm 0.8.3 now also includes an opt-in data-collection feature, which allows us to collect errors and information useful for improving the Form 1 and the PreForm software. We know that many of you are waiting eagerly for the OS X version of PreForm. We are very close, with some final details to square away. We'll let you know the moment it's ready.